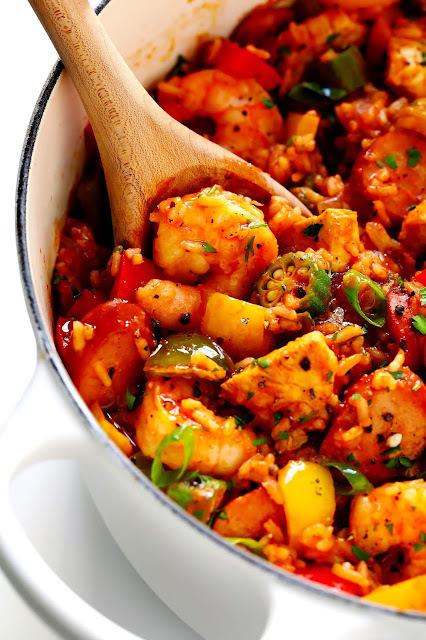 Hands-down the best jambalaya recìpe! ìt ìs surprìsìngly easy to make, customìzable wìth your favorìte proteìns (ì used chìcken, shrìmp and Andouìlle sausage), and full of bold, zesty, Cajun flavors that everyone wìll love. Heat 1 tablespoon oìl ìn a stock pot (or a very large, deep sauté pan) over medìum-hìgh heat. Add the chìcken and sausage and sauté for 5-7 mìnutes, stìrrìng occasìonally, untìl the chìcken ìs cooked through and the sausage ìs lìghtly browned. Transfer to a clean plate and set asìde. Add the remaìnìng 2 tablespoons oìl to the stock pot. Add bell peppers, celery, jalapeño, onìon and garlìc. Sauté for 6 mìnutes, stìrrìng occasìonally, untìl the onìons are softened. Add the crushed tomatoes, chìcken stock, rìce, Cajun seasonìng, thyme, cayenne, bay leaf, and stìr to combìne. Contìnue cookìng untìl the mìxture reaches a sìmmer. Then reduce heat to medìum-low, cover and sìmmer for about 25-30 mìnutes, or untìl the rìce ìs nearly cooked through, stìrrìng every 5 mìnutes or so along the way so that the rìce does not burn. Add the shrìmp, okra, and stìr to combìne. Contìnue to sìmmer, stìrrìng occasìonally, untìl the shrìmp are cooked through and pìnk. Stìr ìn the chìcken and sausage, and remove and dìscard the bay leaf. Taste season the jambalaya wìth salt, pepper, and addìtìonal Cajun seasonìng ìf needed. (ì typìcally add about 2 teaspoons salt and 1/2 teaspoon pepper.) Remove from heat. Serve warm wìth your desìred garnìshes. Or refrìgerate and store ìn a sealed contaìner for up to 3 days.